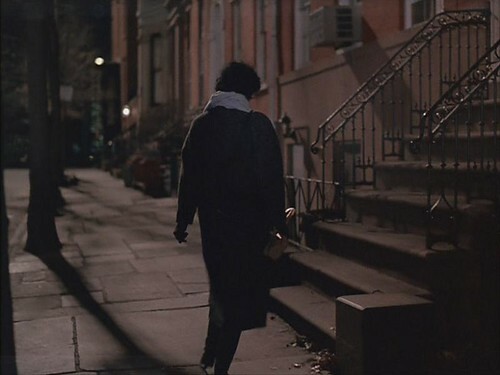 Another favorite film of mine is “Moonstruck.” Cher plays Loretta Castorini, an Italian-American widow living with her parents in Brooklyn, who is torn between her fiancé and his brother. First, here is a video montage created by my daughter Amber, containing her photos, as well as some of mine. Once you have enjoyed that, I have the locations listed below, with the photos. Not all locations in the video are up on this page yet…it’s a work in progress! Here are two views of the Castorini House from the movie. 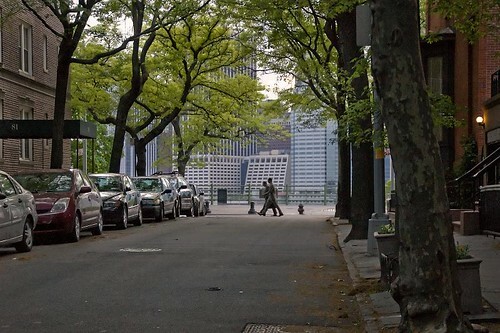 From the movie, looking west on Cranberry Street, heading toward the Brooklyn Promenade, with its views of lower Manhattan. In this scene, Loretta goes to the Cammareri Bakery to invite her fiance’s brother to the wedding. Loretta is standing on the northwest corner of Sackett & Henry Streets, about to cross to the southeast corner to the Cammareri Bros. Bakery. This view is looking south on Henry Street. May 2008. View from the northwest corner of Sackett & Henry Streets, looking south on Henry Street. 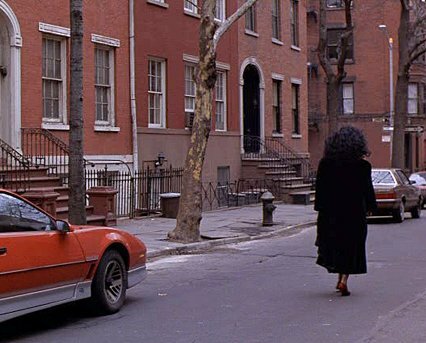 The pharmacy from Moonstruck is still there on the left. On the right is the location where the Cammareri Bakery was located. 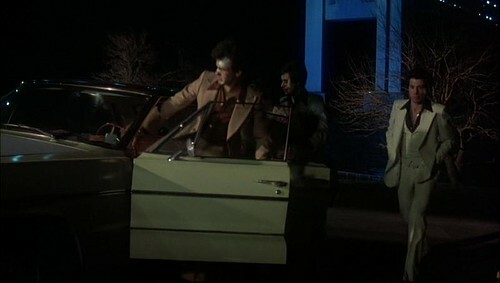 Loretta entering the cellar of the bakery to talk to Ronny. May 2008. 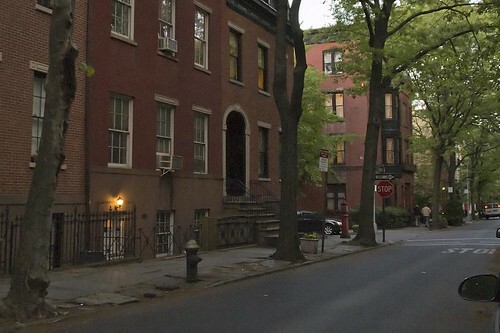 This is where the Cammareri Bros. Bakery was located, and the entrance to the cellar is on the right, by the SUV. 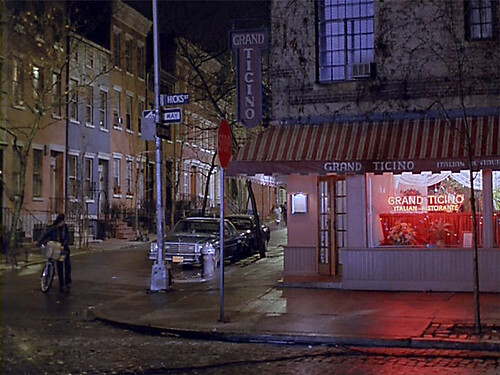 The fictitious restaurant, the Grand Ticino, is featured at various points in the movie. Its first appearance is during a scene when Loretta and Johnny are having dinner and Johnny proposes. Later, Loretta’s mother Rose (Olympia Dukakis), dines alone and meets Perry (John Mahoney), a college professor with a penchant for getting drinks thrown in his face by the college students he dates. According to the street signs, the restaurant is located at Hicks & Cranberry Streets. 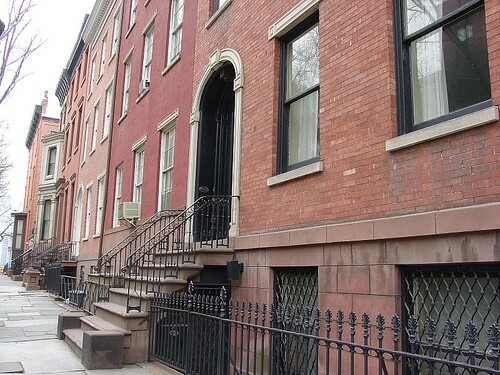 The Castorini home is located at 19 Cranberry Street in Brooklyn, and the characters are depicted as being within a short walking distance. May 2009. 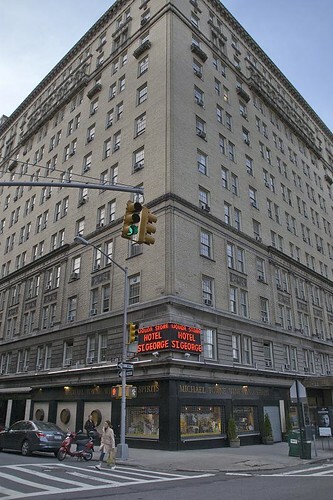 The actual location for the building is in the West Village in Manhattan, at 4th & 12th Streets. I had fun while in New York back in May 2008 tracing the footsteps of Tony Manero, footsteps that walked the streets of Brooklyn to the pulsating rhythm of “Stayin’ Alive.” Of course, Tony Manero, played by John Travolta, is the main character of the film, king of the (paint) store by day and the disco floor by night. 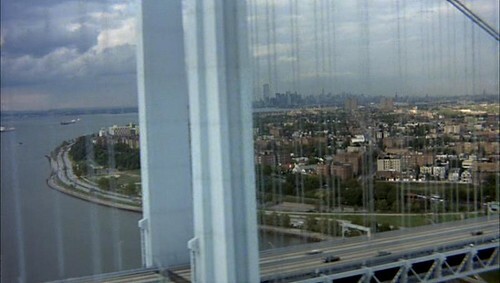 The opening of the film starts with an aerial shot of the Verrazano-Narrows Bridge, which connects Brooklyn to Staten Island. 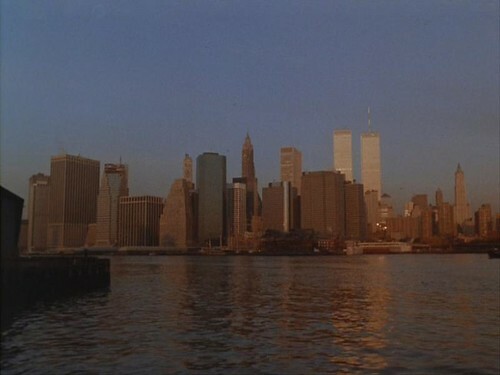 From the point of view of the camera, Manhattan is visible in the background. There’s alot of significance to the scene. You can’t see Manhattan from down on the streets of Bay Ridge (well, not right here, you can’t). 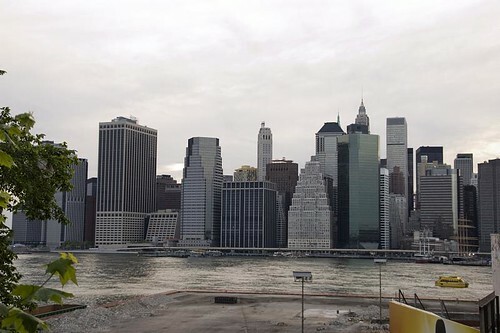 Manhattan is a “far away,” unattainable place to live. 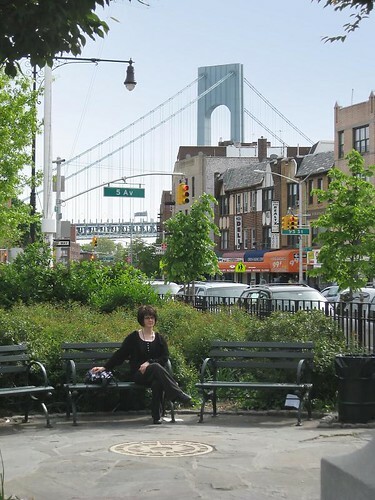 Beyond the bridge, and beyond reach of the Brooklyn kids who feel they’ll never get ahead. 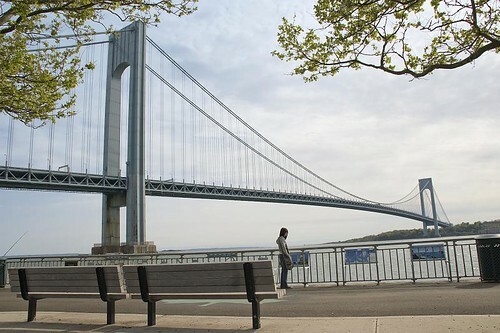 They can see Manhattan, as they will later climb the bridge and taunt Manhattan as they teeter along the edges of the bridge. Here’s a photo I took of the bridge…from down on the ground, of course (as well as from the opposite direction). 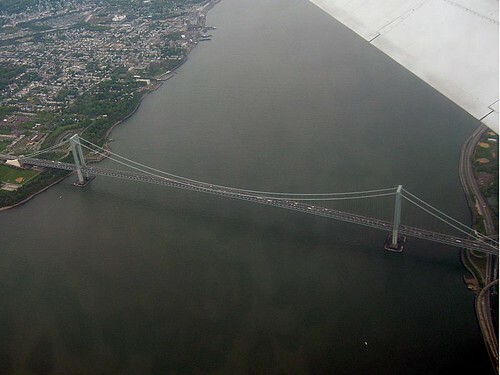 Here’s an aerial shot of the bridge, taken by my daughter Amber during our flight to New York. 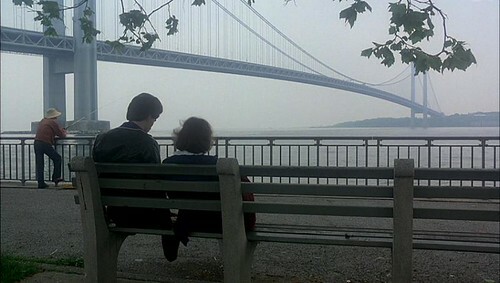 This is a sweet scene where the normally cool, cocky and wisecracking Tony comforts Stephanie by telling her all about the Verrazano-Narrows Bridge. It was filmed at a park below the bridge. 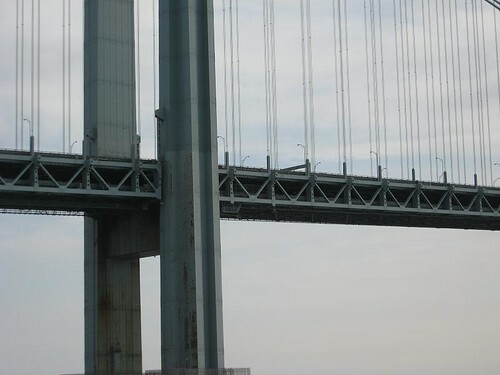 The next scene is pretty dark – it was filmed below the Verrazano-Narrows, after one of Tony’s friends, Bobby C, falls from the bridge into the Narrows. 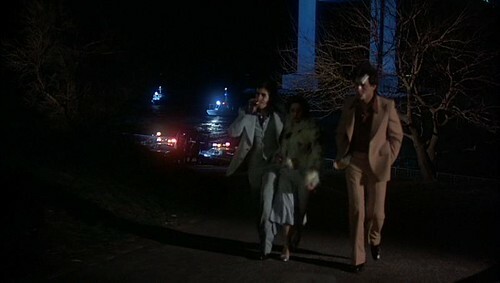 After his death, Tony and his friends leave the Verrazano-Narrows Bridge. Here’s a photo of the same location. Here’s the next part of the movie’s opening. 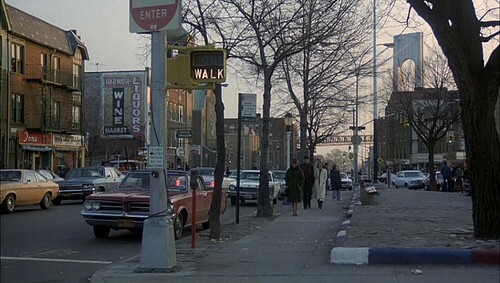 It’s not the greatest split-second shot there is, but scene was filmed on 86th Street near Bay 23rd Street in Bensonhurst, Brooklyn (the movie is set in Bay Ridge). This is where Tony Manero, played by John Travolta, walked with the iconic paint can. Tony is just leaving Lenny’s Pizza, after purchasing two pizza slices and eating them “double-decker” style. Tony’s walk with the paint can was to get a specific color of paint that the hardware store for which he worked didn’t have in stock. 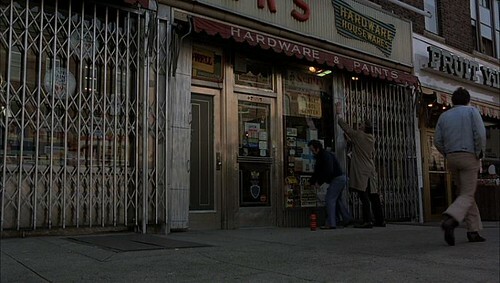 After getting the paint and pizza, he arrives back at Brothers Hardware, where he works. 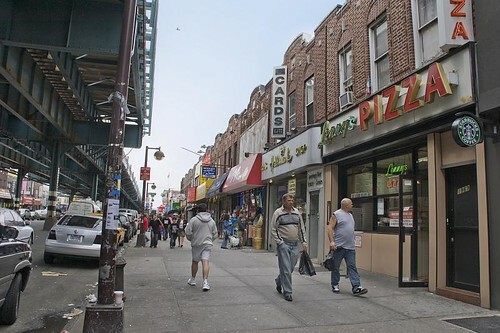 Tony would have worn out a little more shoe leather to get from Bensonhurst to Bay Ridge, where the store is actually located (the film makes the two locations seem closer than they actually are). 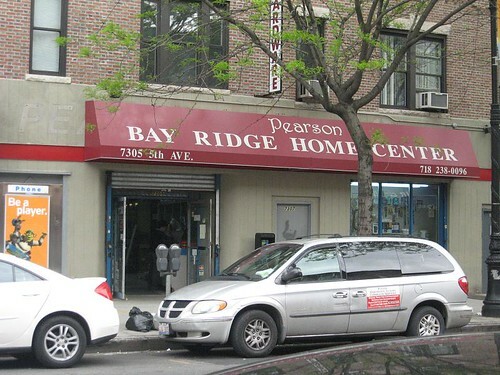 The store is now Pearson’s Bay Ridge Home Center, and got a makeover. 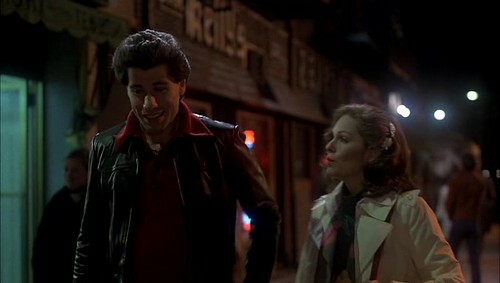 After Tony meets his match in Stephanie Mangano, they go out for coffee. 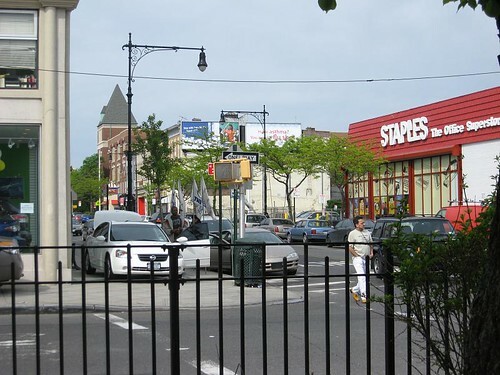 In this scene, they are walking north on 5th Avenue in Bay Ridge, toward a coffee shop at 94th Street. 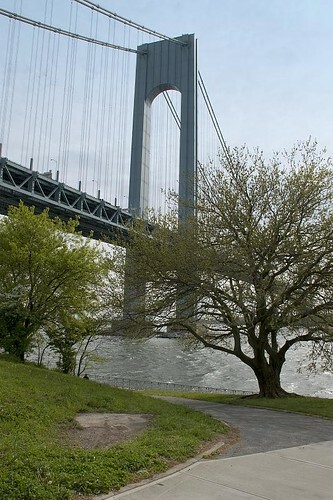 The area to the right is now a small park and the Verrazano-Narrows Bridge is visible in the background. Not quite the same angle, but here I am in the park that was in the barren area above. As Tony and Stephanie continue their walk north on 5th, they are crossing 94th Street, about to go to the coffee shop. This photo was not quite at the same angle (I didn’t have the screenshots at the time), but this is from 5th Avenue, looking across the street. 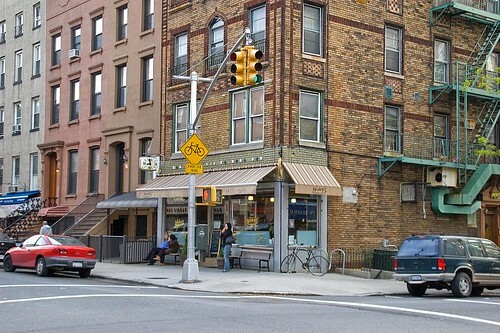 The delicatessen is now a bagel shop and the pizzeria is still operating. I could have definitely used screen captures to get the right angles here, but oh well..here’s what I have. 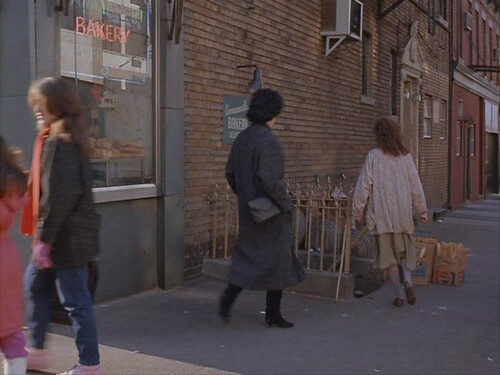 This scene was shot was through the coffee shop window at 94th Street, looking northeast toward 5th Avenue at a Grand Union grocery store. Our photos are not at the same angles, but the next two photos in the set show the Mazda dealership (which this coffee shop became) and a Staples, which used to be the Grand Union in this photo. 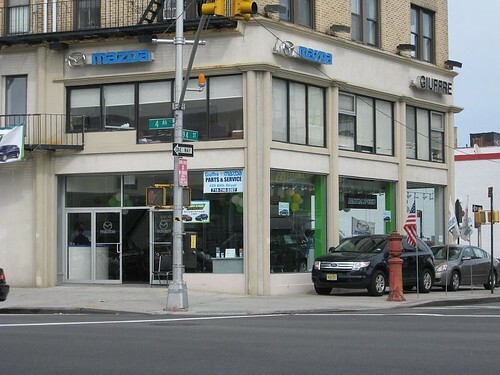 This is the Mazda dealership which now occupies the coffee shop. The glass windows are where the scene above was filmed through. The white building in the background was the Grand Union above and is now a Staples. Compare the above photo of the Grand Union to the 2nd photo below. Though again, we did not have any screen captures, we randomly took photos in this area, where the coffee shop scene was filmed. 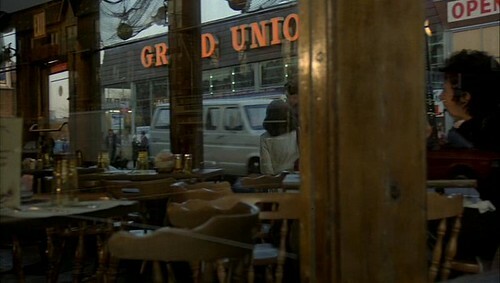 The Staples to the right is the Grand Union in our screen capture above, and the corner of the coffee shop (Mazda dealer) is visible to the left. 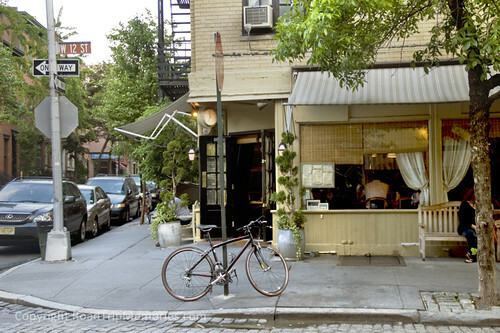 After leaving the coffee shop, Tony & Stephanie walk past Kelly’s Tavern, immediately to the north. The 2001 disco has been demolished, as was the White Castle they hung out in. 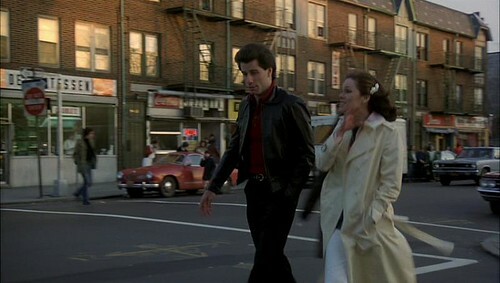 The Manero house is in Bay Ridge, but has been remodeled and doesn’t look like it did in the film. Hope you enjoyed your visit to Brooklyn! Now let’s head over to Junior’s and have some cheesecake! On day 2, we went up to Central Park. We went to Turtle Pond and Belvedere Castle (among others). Afterward, we exited to Central Park West, by the Museum of Natural History. We took the C from 81st to Columbus Circle, where we transferred to the D to Coney Island. 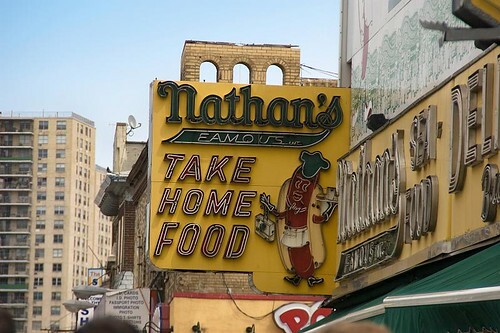 We ate at Nathan’s, but it was fairly chilly, so we ate quickly! 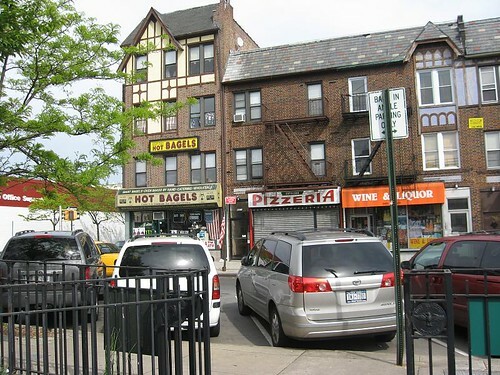 Though the movie is set in Bay Ridge, as I said, this street is actually in Bensonhurst. 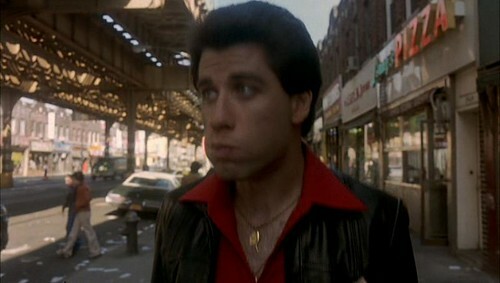 It is featured in the film’s opening scene where Tony Manero, played by John Travolta, walked with the iconic paint can. 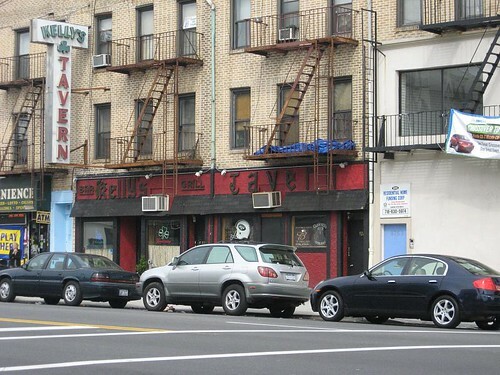 To the right is Lenny’s Pizza, where Tony bought two slices of pizza and ate them double-decker style. After Bay Ridge, we took the R, transferred to the F to Carroll Street. 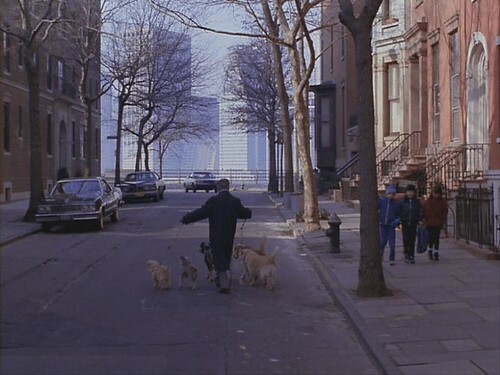 We walked up to Sackett and Henry Streets in Carroll Gardens to another filming location: the Cammareri Bakery from Moonstruck. At one time, this location was the site of the Cammareri Bros. Bakery (as it was in the film), but they closed and the location is now occupied by Naidre’s. In 2006, Cammareri paired with Monteleone to form F. Monteleone & Cammareri Brothers. That bakery is located on Court Street, between Union & President Streets. We stopped there and we each had some gelato and cupcakes. Along the way, we went past the Hotel St. George, where my parents stayed after they got married. 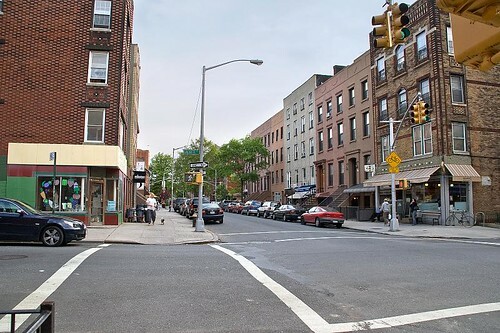 My father was in the Navy and stationed at the nearby Brooklyn Navy Yard, so they stayed at the Hotel St. George until they got an apartment on N. Elliott Place. 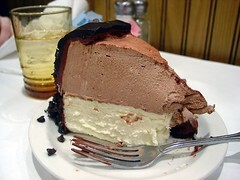 Next it was over to Junior’s for some cheesecake (chocolate mousse cheesecake of course!)! We then went back to our hotel and called it a night. We’re back visiting our family in Connecticut during Amber’s spring break, so I decided to take Amber and her friend Meaghan to New York City for two days. It was cold and dreary, but no precipitation the first day. 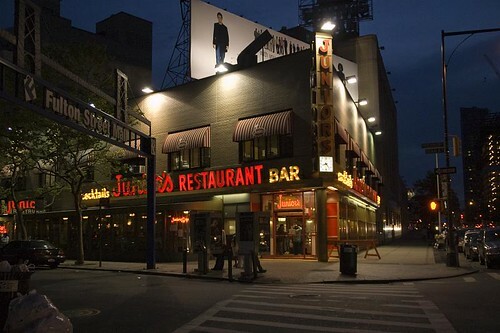 We first had lunch at Junior’s in Brooklyn, where we had way too much food – but what we had was great. Of course, I washed it down with a chocolate egg cream (the real deal – made with Fox’s U-Bet syrup, thank you very much!). We barely had room for dessert, but not having a slice of cheesecake from Junior’s simply isn’t an option. 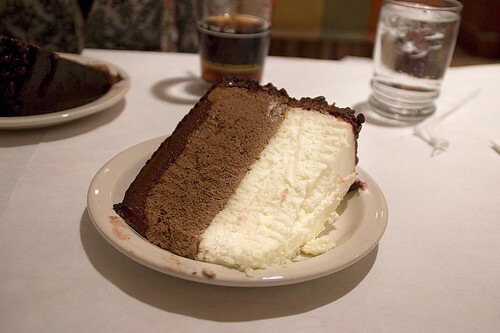 I had a slice of Chocolate Mousse Cheesecake, which is absolutely amazing, decadent and delicious. After we left Junior’s completely and actually (over) satiated, we went back to Manhattan and mostly hung around midtown. We went to Toys R Us, the Plaza Hotel, and Times Square. Later, we drove around the city, and back to Brooklyn. 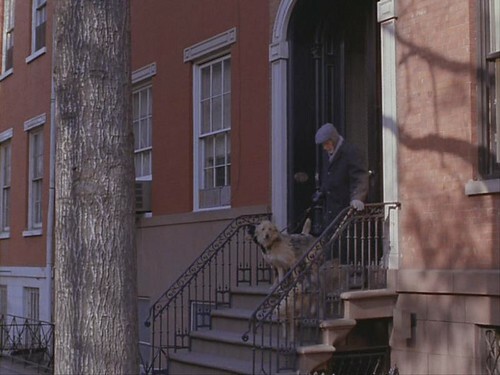 Amber wanted to see the house which was used in the movie Moonstruck as the home of the Castorini family. She has a fascination with this house! The next day it was still dreary, but raining a little, so we drove around and headed back to Connecticut.